gAnalytics : The only way to know whether you are doing the right job is to check the numbers, and the numbers don’t lie. gAnalytics is a great little app that simply plugs into your Google Analytics account and presents the numbers in a format that is easy to read and understand. 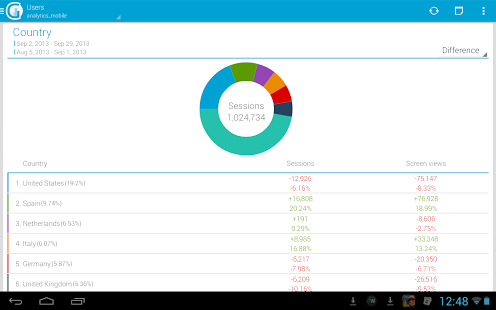 gAnalytics is by far one of the best Android Google analytics apps. With the main options as Panel, Visitors, Content, Goals and Ecommerce, you will feel so comfortable using it on an Android device. You can set the time period and find out the number of visitors, page views, bounce rate, new visits, all this data with the corresponding charts. Also you can compare your report and see it on the charts too. It supports multiple profiles and multiple accounts. Great app. Great job. I found this app 100 times easier and faster then Google Analytics app or desktop version. Keep up the good work. Hey, we need the ads to support the development. Hope you undestand. Did you try the last version? Love it Im addicted to checking site stats on the fly. Thank you.